ARPO needs many goods and services to facilitate our ongoing care efforts. Just some of these are listed below. Please take a look to see whether you have any of these items to donate. No donation is too small! Thanks for your help! ARPO now has a Wish List setup on Amazon.com. If you would like to contribute any items, via Amazon.com, Click Here for dogs & Click Here for cats. ARPO is a Kroger Rewards Community Partner! Enroll today and help ARPO every time you buy groceries. Each new year you need to re-enroll. (NPO #HG427). Click here to enroll. 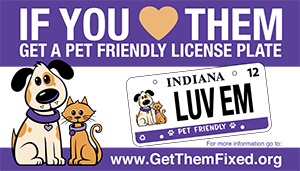 Please help the Spay Neuter Services of Indiana with a license plate that helps fund their services. Learn more. All donations to ARPO, a registered not-for-profit corporation, are tax-deductible. Please see your tax advisor for more information. For more information on donating, send us an email.